The Lord of the temple is praised by Saint Tirunavukkarasar in his Thevaram hymns. 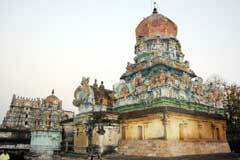 This is the 20th Shiva temple on the southern bank of Cauvery praised in hymns. Maha Shivrathri in February-March and Margazhi Tiruvadhirai in December-January are the festivals of the temple. Lord Panchavarneswara appearing in five different colours is a Swayambumurthy. The temple is open from 7.30 a.m. to 12.00 a.m and 5.30 p.m. to 8.00 p.m.
Sri Kalyana Sundareswarar (Panchavarneswarar) Temple, Tirunallur-614 208, Valangaiman Taluk, Kumbakonam, Thanjavur district. 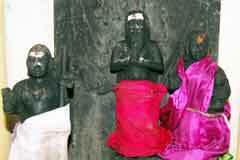 Mother Tirupurasundari blesses the devotees from a separate shrine. There is a shrine for Lord Nataraja with 8 hands in a dancing posture with Lord Kasi Viswanatha, Sage Agasthya, Lord Gananatha and three Saivite Saints Tirugnanasambandar, Tirunavukkarasar and Sundarar. Those born in Magam star pray here to realize their wishes. Also pregnant women pray here by conducting the bangle ceremony for safe delivery. Devotees repay their commitment by tonsuring and performing sandal abishek to Lord and Mother. According to scriptures, the devotee will derive equal benefits by having a bath in the tank of this temple as having one in the Mahamagam tank in Kumbakonam. Kundhidevi mother of Pandavas incurred dosha as she had children with Panchaboodhas. 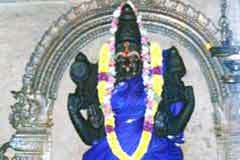 She approached Maharshi Naradha for a solution. Naradha suggested that she should bathe in seven oceans for relief. 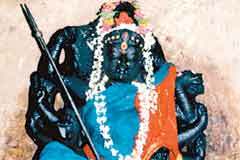 When Kundhi Devi pleaded her inability to do so as women, Narada suggested that she should worship Lord Kalyana Sundareswarar and he would offer the next suggestion then. Before Kundhi finished her prayers here, Narada brought the waters of the seven oceans (Saptha Sagaram) to the tank in the temple. Kundhi belonging to Magam Star bathed in the tank and was relieved of her dosha. 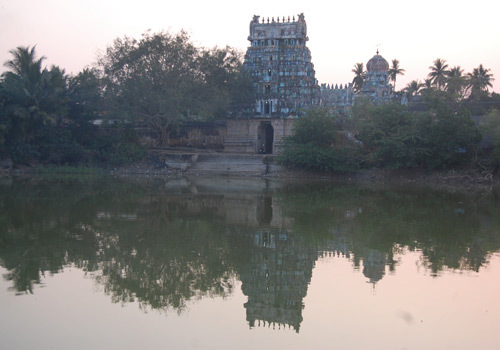 Thus the Nallur temple tank derived equal importance as that of the Kumbakonam Mahamagam tank offering high benefits to the devotees, according to scriptures. Lord Kalayana Sundareswarar appears in five different colours each day - copper, pink, golden, emerald green and one that could not be named or recognized. Hence, is praised as Panchavarneswarar – God of five colours. Lord granted His Feet Darshan (Pada darshan) to Saint Tirunavukkarasar. Hence, the tradition of Sadari blessing as in Vaishnavite temple came into practice here too. Mother Ashtabuja Makali – Mother with eight hands blesses the devotees in the temple. 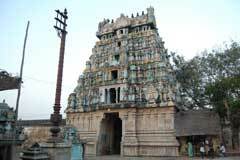 Somaskanda Murthy of the temple is a replica of the one in Tiruvarur temple. During Masi Magam day in February-March, He comes in procession in the prakara. During the procession, though devotees fan Him for the heat, we may observe pearls of sweat on the idol. It is said that the Vilwa tree of the temple is the first one on earth, hence called Aadhi Tree. It would be a unique luck of those praying the Lord with the leaves of this tree. 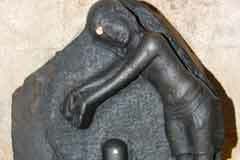 Lord Gana Natha blesses here in the form of a Balipeeta at the entrance of West Tower. It is only in this temple and in Kasi-now Varanasi, Gana Natha graces in this form. A special puja is celebrated annually for Gana Natha. People of this place and those around offer the one time milk they get from their cows for abishek. But devotees cannot see this puja. 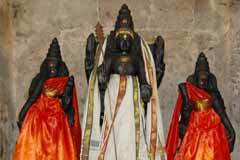 Amarneedhi Nayanar one among the celebrated 63 Nayanmars was granted salvation by Lord in this temple. During the divine Shiva-Parvathi wedding in Mount Kailash, the place went down due to the heavy weight of the presence of all the beings to have this darshan. To balance the level of the earth, Lord Shiva sent Sage Agasthya to South. The sage had to sacrifice his wish of witnessing the wedding. Lord assured him that He would grant the wedding darshan to him in this holy place. 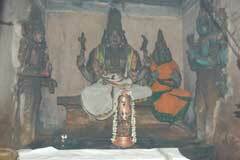 Enjoying the divine darshan here, Sage Agasthya installed a Linga right of the Sundaralingam for his worship. That Linga is behind the presiding Linga. Miracle Based: Lord of this temple is a swayambumurthy appearing in five different colours each day. The temple is under the administration of Tiruvavaduthurai Aadheenam, situated on the Thanjavur-Kumbakonam road, 3 km east of Papanasam in a village named Vazhai Pazha Kadai.